swelling of the mucous membranes of the nose and sinuses after surgery. The sprayer should be kept strictly vertically, upward tip. Holding the head straight, insert the tip into the nostril, squeeze the dispenser with a sharp movement. Then remove from the nose and unclench. At the moment of injection, slightly inhale the air with the nose. Intolerance to the components of the drug. Atrophic rhinitis (including a lake with a fetid discharge). Reception of MAO inhibitors (together with Vibrotsil or within 2 weeks prior to the beginning of use of spray). Children's age up to 6 years. pronounced reactions to sympathomimetics (sleep disturbances, dizziness, etc.). Doctors do not recommend using Vibrocil in pregnant and lactating women. The drug can cause an overdose only if accidentally swallowed, which is more typical for young children. The victim should immediately give activated charcoal and take a laxative or drink plenty of water. There is no specific antidote. Usually the drug is well tolerated. 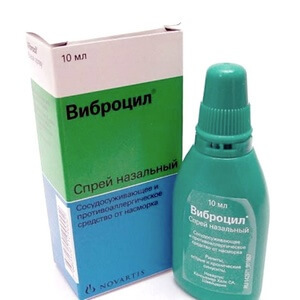 In some cases, symptoms such as burning and dryness of the nose are observed. After discontinuation of the drug, these side effects disappear. 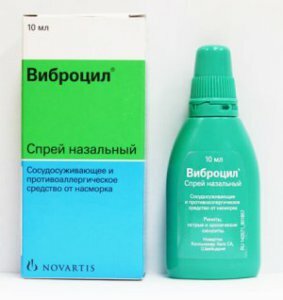 The drug is available as a nasal spray. Packed in 10 ml plastic bottles, equipped with a spray. Vibrocil - a drug of combined action. 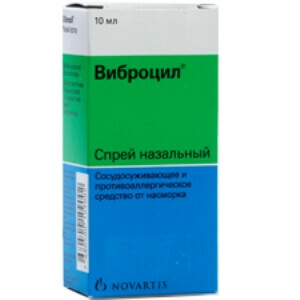 Its effects are due to the content of two active substances - phenylephrine and dimetinden. Phenylephrine belongs to the class of sympathomimetics. 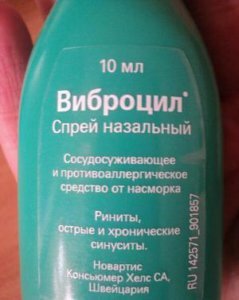 When used topically, the spray stimulates alpha1-adrenoreceptors found in the veins of the nasal mucosa. As a result, the vessels narrow, swelling of the mucous membranes of the nose and paranasal sinuses disappears. Dimetinden - antagonist of histamine H1 receptors. Thanks to him, there is a relief of allergy symptoms. 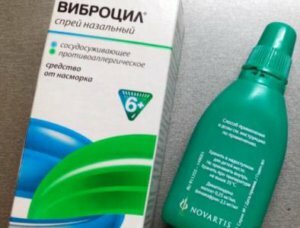 Since the drug is used only topically, its effectiveness does not depend on the level of active substances in the blood. The maximum duration of Vibrocil use is 1 week. After this, it is necessary to consult with the doctor about the possibility of treatment with the drug in the future. development of systemic vasoconstrictor action. If a patient needs to take MAO inhibitors, the use of Vibrocil will have to be postponed and restored only 2 weeks after completion of the course of treatment. Store the drug at temperatures up to +30 degrees. Hide from children.